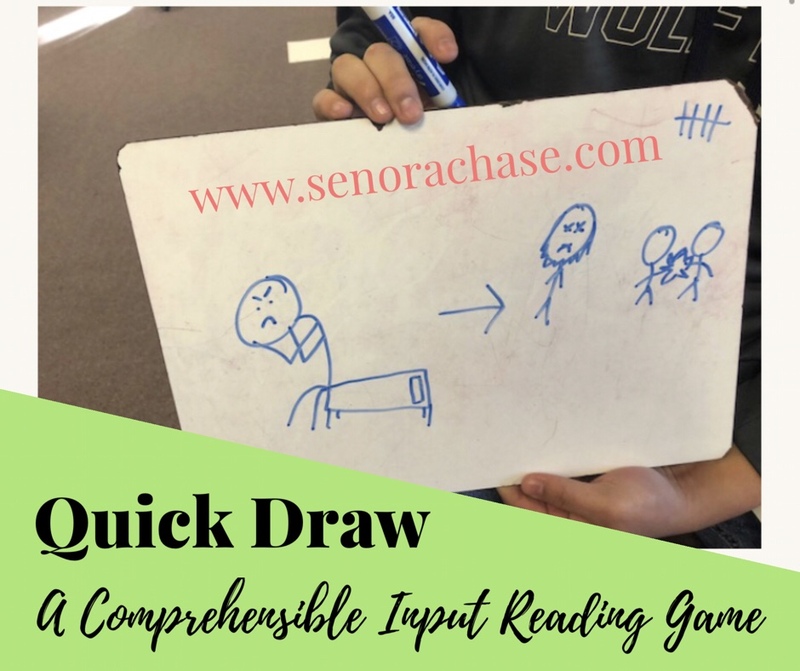 Here’s another comprehensible input game (that kids really think is a drawing game. Shhhhh…..really they’re reading and rereading and rereading). To prep: Type up a story or list of sentences in your target language. Even better, use a story you’ve already read or created as a class. Or if you’re trying to give them lots of input on a specific grammar point, go with that. Here’s one I’m preparing for my Spanish 4s, who are watching and discussing the telenovela Gran Hotel and I want them to read lots of past subjunctive with conditional. Or here’s a Quick Draw that my Spanish 1s play when we’re talking about food and restaurants. Format it so that each sentence is on its own line (So not written in paragraph form) and copy it below so you have the same list of sentences on the top and bottom. Cut the copies in half so each student will have identical half sheets. To play: Students sit facing a partner. (We have animal partners so I tell them to sit with their Monkey partner or whomever.) Both partners need a mini whiteboard, marker, eraser and the reading you prepared. Before the game begins, I ask them to read and translate it with their partner, to make sure that both partners understand everything that is written. Then the game begins: silently both students select a statement to illustrate and begin drawing it on their whiteboard. While students are illustrating, the teacher is counting down backwards in Spanish, from 20. When the teacher gets to 1, both students show their illustration to each other and the race begins. Student A looks at the illustration, looks at her reading sheet and has to figure out which statement Student B illustrated faster than Student B figures out which statement Student A illustrated. Whichever partner reads the correct statement out loud in Spanish faster wins the round and records a point on their whiteboard. After a few seconds the teacher starts counting down again from 20, which is the students’ cue to select another statement and start illustrating again. You can play as many rounds as you like…. In my class the winners get a stamp on their stamp sheet, but whatever floats your boat. Just to make it more fun, if students coincidentally both chose the same sentence to illustrate, the winner gets 2 points instead of 1. Before you begin, really explain to them that as soon as they hear you start counting backwards from 20 they should erase their board and start illustrating a new statement. It gets a little loud when kids are trying to guess their partner’s statement, which I love….BUT as soon as I start counting I expect them to be silent, reading their paper and illustrating their next statement. I’ve gotten surprisingly good at multitasking while counting down from 20- while students are playing this game I straighten my desk, respond to emails, file papers… While everyone is engaged and they don’t need me up front, I use those precious moments to catch up! Thank you! We played this today and it was a hit. I used a YouTube timer that was 30s/30s with different styles of music each interval. I love how they were all working and speaking! Thank you so much for sharing. Honestly, you have saved me a dozen times at least. I am so grateful for your inspiration! You’re welcome! So happy you’ve found something useful on this little corner of the internet! We had finished reading Chap. 1-6 of the novel Esperanza (out of 10 chapters). I had pairs recall 20 different things that had happened so far, writing them on a list together. Then the pairs used these 20 statements to plat the Quick Draw game. Worked well. That’s a great idea…Write and discuss turned into a game- I LOVE IT! !